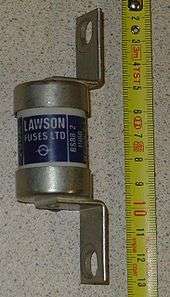 A miniature time-delay fuse that will interrupt a 0.3 A current at 250 V after 100 s, down to a 15 A current at 250 V in 0.1 s. 32 mm (1 1/4") long. In electronics and electrical engineering, a fuse is a type of low resistance resistor that acts as a sacrificial device to provide overcurrent protection, of either the load or source circuit. 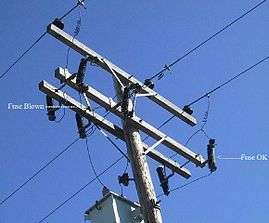 Its essential component is a metal wire or strip that melts when too much current flows through it, interrupting the circuit that it connects. Short circuits, overloading, mismatched loads, or device failure are the prime reasons for excessive current. 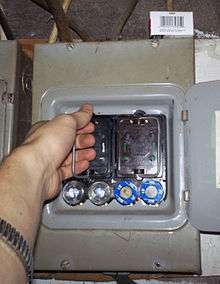 Fuses can be used as alternatives to circuit breakers. In Breguet recommended the use of reduced-section conductors to protect telegraph stations from lightning strikes; by melting, the smaller wires would protect apparatus and wiring inside the building. 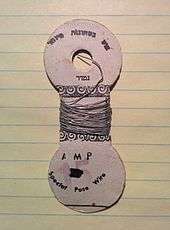 A variety of wire or foil fusible elements were in use to protect telegraph cables and lighting installations as early as 1864. The speed at which a fuse blows depends on how much current flows through it and the material of which the fuse is made. The operating time is not a fixed interval, but decreases as the current increases. Fuses have different characteristics of operating time compared to current, characterized as, according to time required to respond to an overcurrent condition. A standard fuse may require twice its rated current to open in one second, a fast-blow fuse may require twice its rated current to blow in 0.1 seconds, and a slow-blow fuse may require twice its rated current for tens of seconds to blow. Fuse selection depends on the load's characteristics. Semiconductor devices may use a fast or ultrafast fuse as semiconductor devices heat rapidly when excess current flows. The fastest blowing fuses are designed for the most sensitive electrical equipment, where even a short exposure to an overload current could be very damaging. Normal fast-blow fuses are the most general purpose fuses. The time delay fuse (also known as anti-surge, or slow-blow) are designed to allow a current which is above the rated value of the fuse to flow for a short period of time without the fuse blowing. These types of fuse are used on equipment such as motors, which can draw larger than normal currents for up to several seconds while coming up to speed. The I2t rating is related to the amount of energy let through by the fuse element when it clears the electrical fault. This term is normally used in short circuit conditions and the values are used to perform co-ordination studies in electrical networks. I2t parameters are provided by charts in manufacturer data sheets for each fuse family. For coordination of fuse operation with upstream or downstream devices, both melting I2t and clearing I2t are specified. 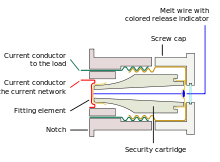 The melting I2t, is proportional to the amount of energy required to begin melting the fuse element. The clearing I2t is proportional to the total energy let through by the fuse when clearing a fault. The energy is mainly dependent on current and time for fuses as well as the available fault level and system voltage. Since the I2t rating of the fuse is proportional to the energy it lets through, it is a measure of the thermal damage from the heat and magnetic forces that will be produced by a fault. The breaking capacity is the maximum current that can safely be interrupted by the fuse. Generally, this should be higher than the prospective short circuit current. Miniature fuses may have an interrupting rating only 10 times their rated current. Some fuses are designated High Rupture Capacity (HRC) and are usually filled with sand or a similar material. Fuses for small, low-voltage, usually residential, wiring systems are commonly rated, in North American practice, to interrupt 10,000 amperes. Fuses for larger power systems must have higher interrupting ratings, with some low-voltage current-limiting high interrupting fuses rated for 300,000 amperes. Fuses for high-voltage equipment, up to 115,000 volts, are rated by the total apparent power (megavolt-amperes, MVA) of the fault level on the circuit. Voltage rating of the fuse must be equal to or, greater than, what would become the open-circuit voltage. For example, a glass tube fuse rated at 32 volts would not reliably interrupt current from a voltage source of 120 or 230V. If a 32V fuse attempts to interrupt the 120 or 230 V source, an arc may result. 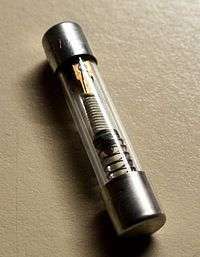 Plasma inside the glass tube may continue to conduct current until the current diminishes to the point where the plasma becomes a non-conducting gas. 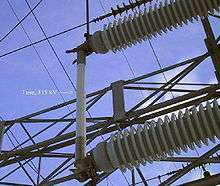 Rated voltage should be higher than the maximum voltage source it would have to disconnect. Connecting fuses in series does not increase the rated voltage of the combination, nor of any one fuse. A voltage drop across the fuse is usually provided by its manufacturer. There is a direct relationship between a fuse's cold resistance and its voltage drop value. Once current is applied, resistance and voltage drop of a fuse will constantly grow with the rise of its operating temperature until the fuse finally reaches thermal equilibrium or alternatively melts when higher currents than its rated current are administered over sufficiently long periods of time. This resulting voltage drop should be taken into account, particularly when using a fuse in low-voltage applications. Voltage drop often is not significant in more traditional wire type fuses, but can be significant in other technologies such as resettable (PPTC) type fuses. Ampere rating of the fuse. IEC and UL nomenclature varies slightly. IEC standards refer to a "fuse" as the assembly of a fuse link and fuse holder. 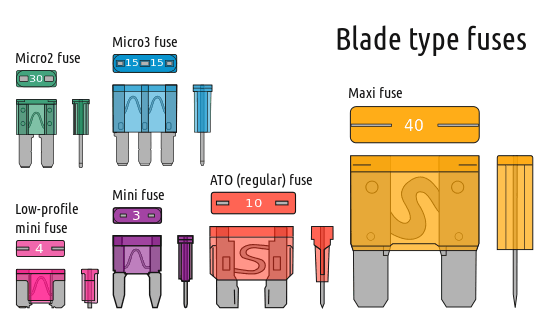 In North American standards, the fuse is the replaceable portion of the assembly, and a fuse link would be a bare metal element for installation in a fuse. 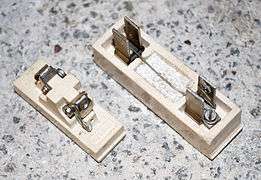 In North America, fuses were used in buildings wired before 1960. These Edison Base fuses would screw into a fuse socket similar to Edison-base incandescent lamps. Ratings were 5, 10, 15, 20, 25, and 30 amperes. To prevent installation of fuses with an excessive current rating, later fuse boxes included rejection features in the fuse-holder socket, commonly known as Rejection Base (Type S fuses) which have smaller diameters and vary, depending on the rating of the fuse. This means that fuses can only be replaced by the preset (Type S) fuse rating. This is a North American, tri-national standard (UL 4248-11; CAN/CSA-C22.2 NO. 4248.11-07 (R2012); and, NMX-J-009/4248/11-ANCE). Existing Edison fuse boards can easily be converted to only accept Rejection Base (Type S) fuses, by screwing-in a tamper-proof adapter. This adapter screws into the existing Edison fuse holder, and has a smaller diameter threaded hole to accept the designated Type S rated fuse. A thermal fuse is often found in consumer equipment such as coffee makers, hair dryers or transformers powering small consumer electronics devices. They contain a fusible, temperature-sensitive alloy which holds a spring contact mechanism normally closed. When the surrounding temperature gets too high, the alloy melts and allows the spring contact mechanism to break the circuit. The device can be used to prevent a fire in a hair dryer for example, by cutting off the power supply to the heater elements when the air flow is interrupted (e.g., the blower motor stops or the air intake becomes accidentally blocked). Thermal fuses are a 'one shot', non-resettable device which must be replaced once they have been activated (blown). ↑ "Fuse Element Fatigue" (PDF). Cooper Bussmann. Retrieved 2015-05-26. ↑ A. Wright, P.G. Newber (Jan 1, 2004). Electric Fuses, 3rd Edition. IET. pp. 124–125. ↑ "Identify a fuse by its markings". Swe-Check. Retrieved 2013-09-09. ↑ "Fuse Carrier Hager". Hager Group website > Products. Hager Group. Retrieved 2009-02-03. ↑ "MB". Cooper Bussmann. Retrieved 2012-03-27. ↑ "Mini-Breaker Spec St" (PDF). Connecticut Electric, Inc. Retrieved 2012-03-27. ↑ "NEC Articles 215 through 240". Mike Holt Enterprises, Inc. Retrieved 2012-09-12. Wikimedia Commons has media related to Fuses.